"The short description of FarmVille is this: “FarmVille is a game where you can farm with your friends.” Basically you get a plot of land and you have to plant crops, harvest them, make money to buy new and better things. But if you are one of the more than 350 million Facebook users, then you already know this. 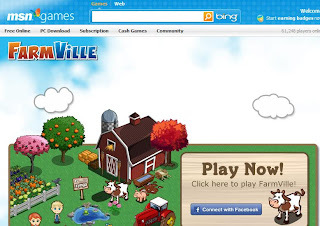 With more than 75 million monthly active users, you can say that FarmVille is one of the more popular apps on the social networking site. It seems that 75 million users is not a big enough number for Zynga, the company behind FarmVille and numerous other Facebook apps. So the company partnered up with MSN Games, thus allowing these users to play the game on the site, using Facebook Connect. It also means that Windows Live Messenger users will be able to play the game. And because Facebook Connect is involved, these users can interact will all the existing 75 million FarmVille players..."